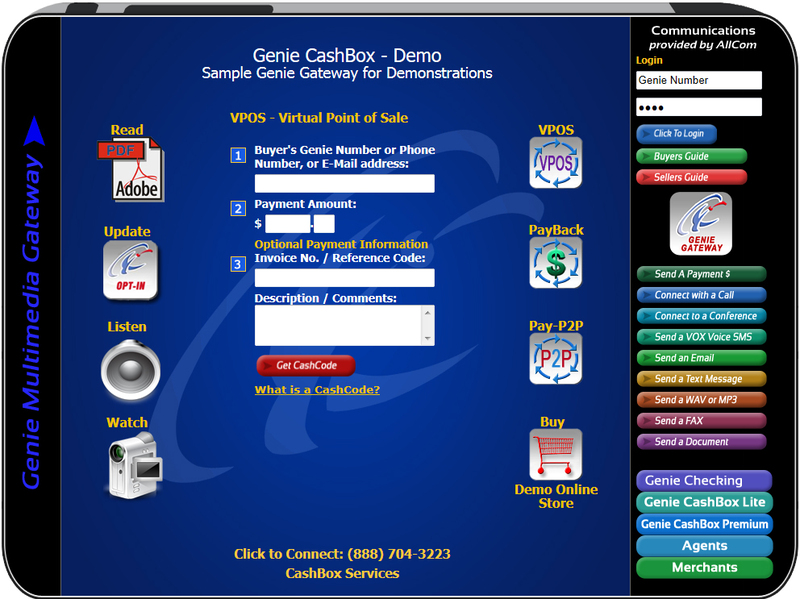 Genie Gateway is an interactive multimedia communications hub, featuring a digital buffet of unified solutions; combining the benefits of having a website fully accessible from any internet enabled device, with voice, text, video, document messaging, virtual fax, group communications, including an online store, a shopping cart with a virtual point of sale, and a CashBox with a GenieCard and a GenieChecking account, plus the most robust Virtual Office, as one unified solution. Buyers NO longer need to provide their credit card, or bank account information, to make a payment. Repeat customers ONLY need their cell number, and "Click to OK" their purchase on their cell phone. 1. Pay for your goods and services using their cell number, GenieCard, or email address, and click to OK their purchase, on their cell phone, before any payment is sent. 2. Alternative Online Payments using Bill Pay (150 Top US Banks), GenieCard, Genie Credits, GenieChecking, and Check22. 4. Hear your recorded messages, updates and announcements anytime. 6. Read and print your brochures and documents online. 7. Send payments directly to your CashBox, in person, on the phone, or online from any internet enabled device. 8. Purchase your goods and services with a few clicks in your own online store, shopping cart, or by phone. 9. Create their personal GenieChecking account free of charge. Your Genie Gateway is the absolutely UNIQUE web/email tool that links people to you, free of charge from ANYWHERE in the world! 1. Genie Gateway: Get all of the benefits of your own website and online multimedia web-presence even if you do not have your own website. 2. Genie CashBox: The faster safer way to pay and get paid online, via mobile devices, in store or by phone and send payments, without sharing financial information. 3. GenieCheck: Virtual Checking Account, the newest and safest way to send or receive money electronically. It has all the benefits of a traditional paper check, plus the added security of 24X7X365 FREE check verification, and the one of a kind ability to be sent by email. 4. GenieCard: The GenieCard combines the best of TWO worlds, the Genie Club - our closed loop member service, which utilizes the Genie CashBox - and Check22, the open loop service which lets members access their funds from any checking account, in any bank in the US. 5. Text Messaging: Receives text messages from anyone, anywhere, worldwide free of charge without giving out your cell number. 6. Videos: Display your video describing your goods or services online with one click. 8. PDF Documents: Display your brochures and documents online with one click. 9. Opt-In App: Convert visitors into potential customers in two seconds. 9. Search Engine Optimizations: Your customers, friends and business associates will be able to find you online by using Google, Yahoo, Bing and most other search engines. 10. Toll-Free Number: Get your own toll-free number, good everywhere in the US and Canada. 11. Call Screening: Genie answers your calls as your "personal assistant" and lets you know who's calling. 12. Caller ID Blocking: Block unwanted calls with a single push of a button. 13. Call FollowMe: Receive calls on your cell phone or any three alternate telephone numbers. 14. Group Messaging: Send free voice and text messages to everyone in your Genie PhoneBooks. 15. Voicemail: Access messages from any phone or online on any sound equipped device. 16. GenieMail: Read your emails and hear your voicemail messages, see your faxes on your cell or any computer no matter where you are. 17. Virtual Fax Machine: Receive faxes online as an email attachment anywhere, anytime. 18. GenieMessenger: Unlimited free domestic and international messaging. 19. Virtual Conference Room: Conference with up to ten people on any phone, anytime. *All services Work with your existing cell phone or land line and computers, there's no need to change phone companies. Genie Gateway is introduced to merchant at a disruptive price point of $9.95 per month, with a $1 trial period for the first month.